To broaden participation in computing and engineering fields, it is important to consider all underrepresented groups, including individuals with disabilities. Listed below are some considerations for making the project you are proposing or implementing fully inclusive of individuals with disabilities along with useful resources to learn more. Include students with disabilities in existing outreach activities. Broadening Participation in Science and Engineering by Welcoming Participants with Disabilities and Equal Access: Universal Design of Your Project provide tips and advice for ensuring activities are accessible. To recruit participants with disabilities, in K-12 settings, contact special education professionals or schools that cater to students with disabilities. At a postsecondary institution, a good place to start is to develop a short email message describing your offering and sending it to the disability resources office, veterans center, and student organizations that support individuals with disabilities. Be sure to include a statement on how students can request a disability-related accommodation. Here are examples of other NSF-funded projects that consider disability. Develop an outreach activity focused on students with disabilities. Many of the same outreach activities used in computing education more generally can be adapted for students with disabilities. You might have a camp, workshop, or hackathon focused on disability. For ideas, consult our Promising Practices and replication packages. Host a student with a disability in a summer research internship. Consider recruiting a postsecondary student through the campus disability services office or partnering with the DREU (Distributed Research Experiences for Undergraduates) program. See Offer an Internship and Finding Gold: Hiring the Best and the Brightest. Encourage faculty and staff to be welcoming and accessible to students with disabilities. We have found that professional development activities that bring together faculty and staff can make a difference for students with disabilities. 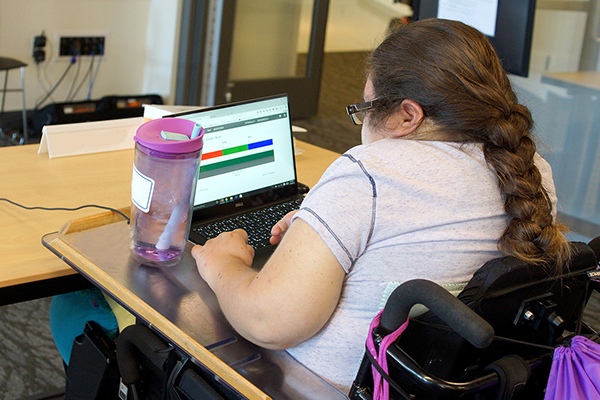 You could offer web accessibility trainings, host a Capacity Building Institute or disseminate resources like Working Together: Faculty and Students with Disabilities. See also Hosting a Panel of Students with Disabilities: A Promising Practice in Raising Awareness of Disability Issues. Design accessible curriculum and instruction. Consider how you can develop and deliver courses that are inclusive of students with a wide variety of disabilities and other characteristics. Learn from students with disabilities why Quality Education Is Accessible. For specific inclusive strategies view the short videos How Can We Include Students with Disabilities in Computing Courses?, Communication Access Realtime Translation: CART Services for Deaf and Hard-of-Hearing People. For more inclusive strategies consult Equal Access: Universal Design of Instruction. Include disability-related content in courses. Teach about accessible/universal/inclusive design in your courses so that future computer scientists and engineers will develop IT and other products that are accessible to users with a wide variety of abilities. To learn why these skills are important in a postsecondary setting, view the short video IT Accessibility: What Campus Leaders Have to Say. For examples of including disability-related content in engineering courses view Including Universal Design in the Engineering Curriculum. For examples of curricula in computing courses consult Teach Access Resources. Make sure your website, documents, and online curriculum are accessible to visitors with disabilities. For example, include text descriptions of content presented in images on your website, in your newsletter, or in your curriculum so that they can be read by screen readers that read aloud text for individuals with visual or learning disabilities. To learn how to make your website accessible, view the short videos IT Accessibility: What Web Developers Have to Say and World Wide Access: Accessible Web Design. For details consult 30 Web Accessibility Tips. To learn how to make your documents accessible, view the short video Creating Accessible Documents. For more detail consult the UW website Creating Accessible Documents. To make your online course accessible to potential students with disabilities view the video and short publication 20 Tips for Instructors about Making Online Learning Courses Accessible. Routinely caption videos not only to make them accessible to individuals who are deaf, but also more usable by English language learners, individuals with learning disabilities, and those who simply wish to see the spelling of words spoken. To learn more view the short videos Captions: Improving Access to Postsecondary Education, Making Videos Accessible, and Captioning Lecture Capture Videos: A Promising Teaching Practice. For more details consult Creating Accessible Videos. Partner with a disability-related organization. Consider including an organization with expertise in disability-relates issues as a subcontractor in your grant proposal or funded project. This group could be associated with special education in the K-12 setting, disability services in higher education, or nationwide organizations such as the DO-IT Center. AccessComputing staff members are happy to partner with you or help you identify other resources or partners to engage in these activities. For information about these and other topics regarding the inclusion of individuals with disabilities in computing academic programs and careers consult the AccessComputing website.